Silk ball valve pneumatic actuators for the original Italian import famous brands, superior quality and stability. Life of more than 1 million. Casting for the skim door, imported CNC lathe manufactured in China for Japan HITACHI's OEM OEM products, rigorous testing by the company, the service life 100,000 times or more, a number of national patent design, quality alternative to Western and Japanese imports . Positioned as a high-end products, widely used in the high quality requirements of the valve of large foreign companies such as chemical gas, spandex plant, chemical plants, natural gas, machinery and equipment, pharmaceutical, food, petrochemical, and other. 500 companies in the world, often used to replace the imported valve. 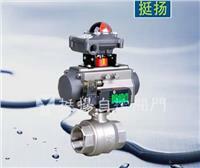 Features: ☆ body between the ball and anti-static devices; ☆ by API607 fire safety design certification; ☆ stem anti-extrusion design; ☆ pressure balance valve hole design; ☆ ISO5211 high platform; ☆ double disc springs enhance stem seal ; ☆ control type: O type emergency cut-, V-proportional control type; ☆ structure: full-flow straight-through; ☆ connection type: BSPT, NPT, BSP, G thread form; ☆ nominal diameter: DN15 ~ DN80; ☆ body material: CF8M, CF8, WCB; ☆ sealing materials: PTFE, R-PTFE, EK, PEEK; ☆ working pressure: 1000PSI, 2000PSI ☆ Operating temperature: -20 ℃ ~ +220 ℃.